Receive 3 printed 8x10’s for your portfolio. I acknowledge that upon meeting the NMS Staff I will personally sign the hard copy, printed version of this same agreement. I certify that I have submitted the participation fee and understand that it is nonrefundable. I also promise that prior to the show, I will sign another waiver guaranteeing the processing of the participation fee and release of all images and video recorded at the event in which I am attending. 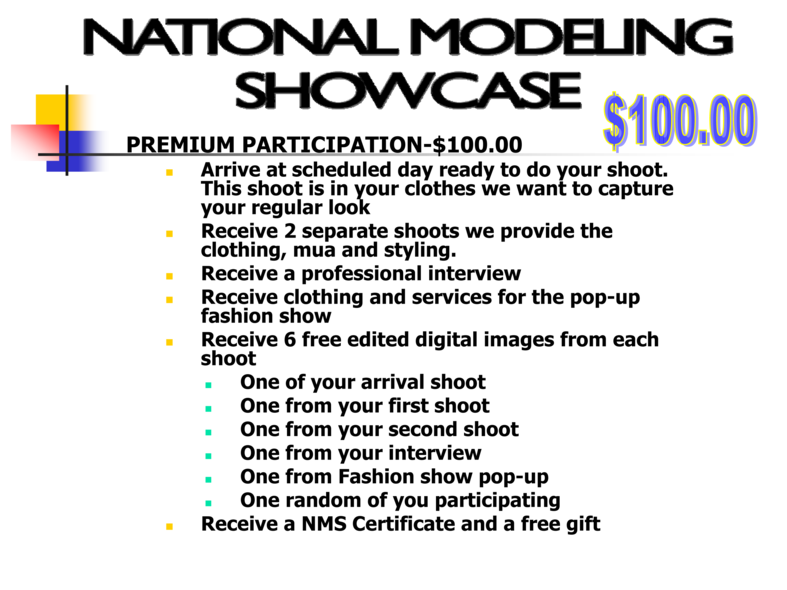 I certify that I am physically fit, have sufficiently trained for participation in the National Modeling Showcase and have not been advised otherwise by a qualified medical person. 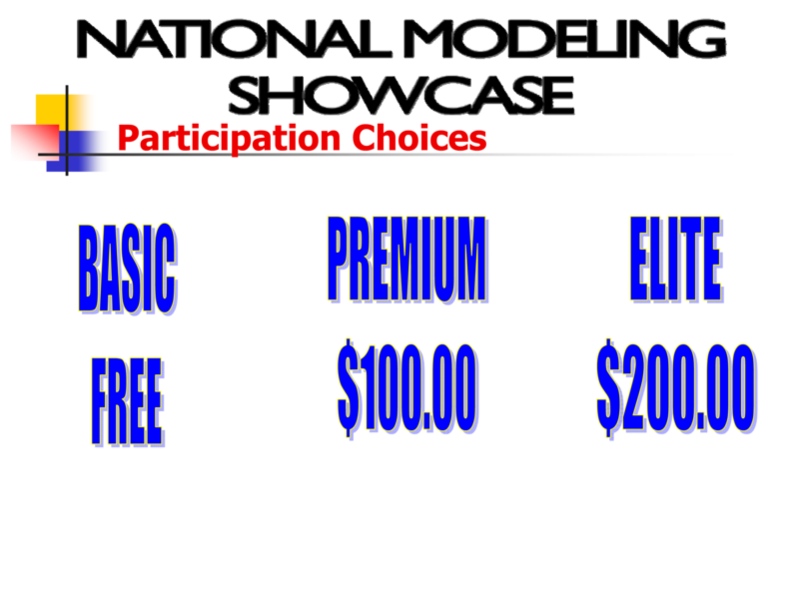 I acknowledge that this modeling showcase/dance event is a test of a person’s physical and mental abilities and carries with it the potential for serious injury, death and property loss. The risks include, but are not limited to, those caused by terrain, facilities, temperature, weather, condition of models/actors/dancers, equipment, vehicular traffic, actions of other people including, but not limited to, participants, volunteers, spectators, coaches, event officials, and event monitors, and/or producers of the event, and lack of hydration. These risks are not only inherent to models/actors /dancers, but are also present for volunteers and guests. I hereby assume all of the risks of participating and/or volunteering in this event. Further, I agree to examine the physical staging area of the competition for any possible defects (e.g., wet or oily surface, cracks, etc. ), and, without limiting the generality of the foregoing, waive any and all claims relating to the physical staging area of the Competition. I realize that liability may arise from negligence or carelessness on the part of the persons or entities being released, from dangerous or defective equipment or property owned, maintained or controlled by them or because of their possible liability without fault. I acknowledge that this Accident Waiver and Release of Liability form will be used by the event holders, sponsors and organizers, in which I may participate and that it will govern my actions and responsibilities at said events. In consideration of my application and permitting me to participate or volunteer in this event, I hereby take action for myself, my executors, administrators, heirs, next of kin, successors, and assigns as follows” (A) Waive, Release and Discharge from any and all liability for my death, disability, personal injury, property damage, property theft or actions of any kind which may hereafter accrue to me including traveling to and from this event, THE NATIONAL MODELING SHOWCASE, the Producers and Sponsor(s) of the Competition and its related activities, and all agents, employees, venues and licensees of the foregoing, their directors, officers, employees, volunteers, representatives, and agents, the event holders, event sponsors, event directors, event volunteers; (B) Indemnify and Hold Harmless the entities or persons mentioned in this paragraph from any and all liabilities or claims made as a result of participation or volunteering in this event, whether caused by the negligence of releases or otherwise. I hereby consent to receive medical treatment and ambulance service that may be deemed advisable in the event of injury, accident and/or illness during this event. I shall be liable and immediately pay all costs and expenses incurred in connection with such medical and travel services rendered. I understand that at this event or related activities, I may be photographed and/or videotaped. I hereby consent to you and you successors in interest, photographing me and recording my voice and performance, if any, and using my picture photograph, silhouette and other reproductions of my physical likeness and sound (as the same may appear) in any still camera photograph and/or motion picture, video tape or motion pictures in which the same may be used or incorporated, and also in the promotion exploitation and/or publicizing of any such motion picture or tape, but not limited to radio, television or theatrical motion picture or tape. I agree to allow my photo, video tape or film likeness to be used for any legitimate purpose on an irrevocable and unlimited basis by the event holders, producers, sponsors, organizers and or assigns without any compensation or payment being made for such use and further use thereof. This Accident Waiver and Release of Liability shall be construed broadly to provide a release and waiver to the maximum extent permissible under applicable law. I hereby certify that I have read this document; and, I understand its content. I also understand that this is a professional environment, with consistent changes. Any participant and or their guest that are found to being rude, heckling, stealing, inciting negativity, speaking doing recording, or abusing the facility in anyway will be asked to exit the premises with no recourse of refund or quid pro quo, the result will be that security and or the NMS staff will invite you and your guest to depart immediately. NMS ask that at all times that you the participant will be mindful and courteous of others feelings, personal space and perceptions. 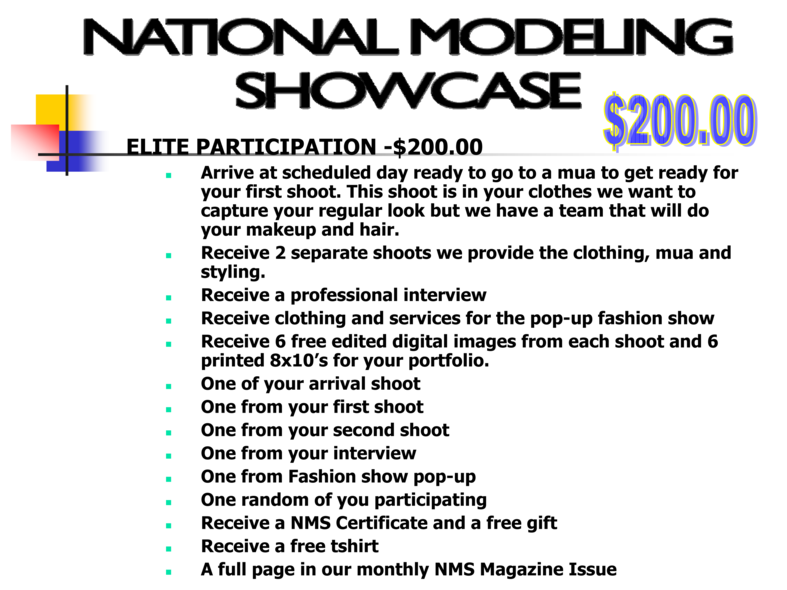 The NMS is a recorded event that allows models, actors, and performers to experience all facets of modeling and acting. NMS does reserve the right to adjust the format of the show to accommodate participants, and may have to reschedule a show if services cannot be rendered on the date that the participant signed up. 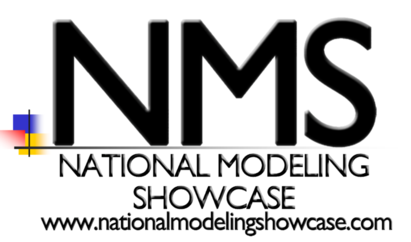 NMS will however reschedule the event and inform participant of changes and do whatever is possible to assure the participants attendance including selecting a date that works best for the participant. If an NMS event is rescheduled or moved there will be no refund given, to the participant. If participant cannot make the new date NMS will strive to find a date that works for all. NMS reserves the right to publish as much or as little of the recorded content anywhere it seems fit. Participants must check NMS social media for publishing updates.